I've finally been talked into putting something on my web page, so here it is. I spend a lot of time moving from machine to machine and OS to OS and that used to mean maintaining my PATH and other settings all over the place. I also was constantly frustrated by typing things like ps ax on Solaris and having it not work. Thus was born my .bashrc. Over time, more and more stuff has been added as it swallowed ideas from all over the place. More recently I've become a zsh user, so obviously I ported my file to zsh. Currently the .zshrc file is more frequently updated. I've been doing a bit with Solaris 10 recently. In Solaris 10, Sun have taken the bold step of replacing the crufty old System V rc script system with a new system called the Service Management Facility. 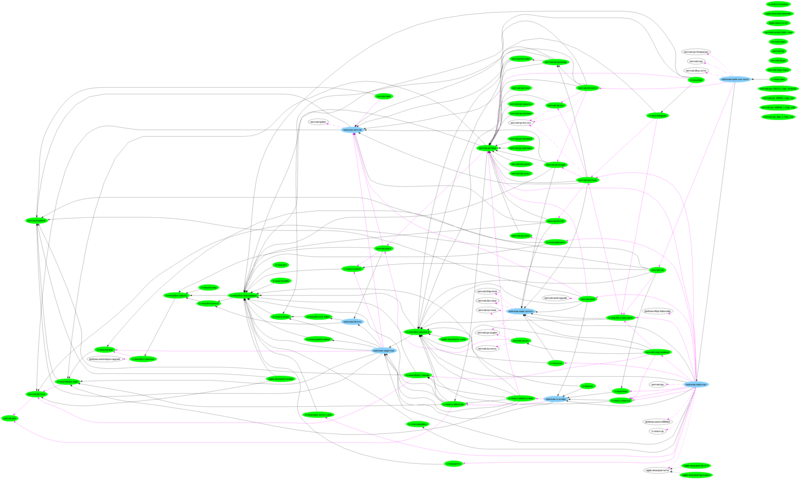 There are a number of reasons for this, which I won't go into here, but one of the nice features is that the OS now has a full dependency graph of services. Inspired by an entry in Stephen Hahn's blog, I thought I'd see what I can do about visualising that graph. Note: a program to generate much better graphs than mine is now available from the opensolaris smf community site. Ellipses represent services. 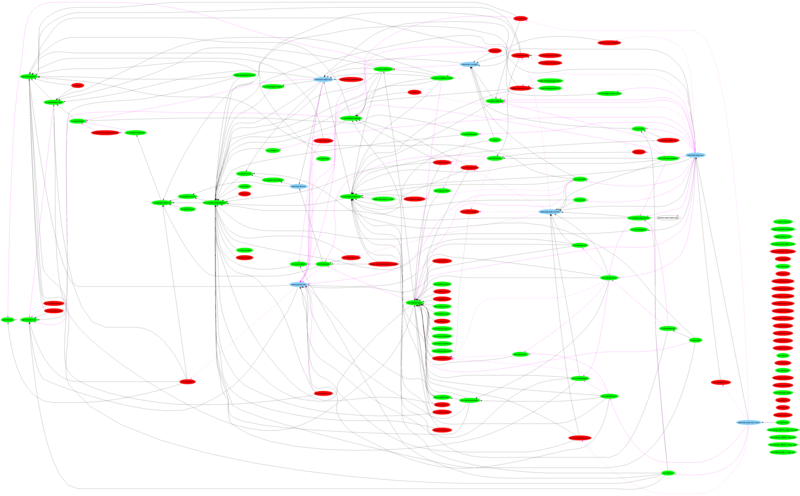 Blue ellipses are milestones, green are enabled services, red are disabled. 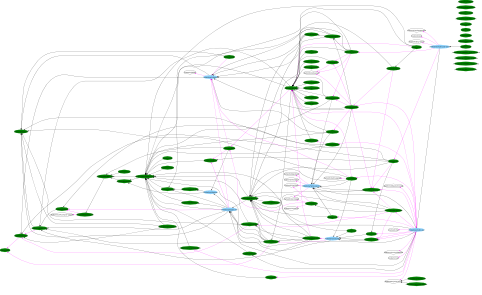 Arrows are dependencies. They point from the depending service to the resource they depend on. 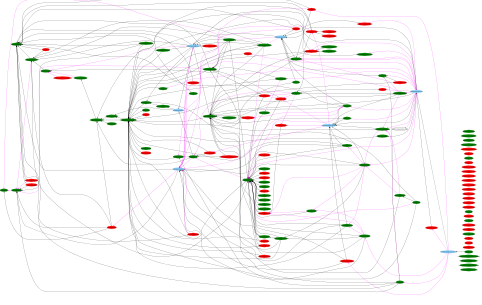 Magenta arrows are optional dependencies. Services on the left will be started before those on the right. Here are full-sized versions: PNG (warning, this file, although only 500k, is over 7000×4000 pixels), PostScript (a4), PostScript (letter), SVG, PDF (a4) and PDF (letter). This version is a little simpler, since it leaves out the disabled services. Some enabled services still depend (optionally) on disabled services. Those disabled services are shown as white ellipses. Brendan Gregg's page has become one of the most authoritative sources of information about DTrace outside Sun, and perhaps the only source of information about dtksh! He also has a number of essential performance and security tools, and some special tools for advanced administrators. Stephen Hahn's blog has Some good info on SMF. His site was the inspiration for the graphs above. Tobin Coziahr's blog has lots of nice information about the use of, and some of the thinking behind, SMF. Bryan Cantrill gives an insight into the development of an OS, and has a particularly nice post on Demo'ing DTrace. Casper Dik has a description of Privileges from Solaris 10 that suits my somewhat academically aligned thought processes.